240 pages | 20 B/W Illus. Too often, observers of globalization take for granted that the common ground across cultures is a thin layer of consumerism and perhaps human rights. If so, then anything deeper and more traditional would be placebound, and probably destined for the dustbin of history. But must this be so? Must we assume--as both liberals and traditionalists now tend to do--that one cannot be a cosmopolitan and take traditions seriously at the same time? This book offers a radically different argument about how traditions and global citizenship can meet, and suggests some important lessons for the contours of globalization in our own time. Adam K. Webb argues that if we look back before modernity, we find a very different line of thinking about what it means to take the whole world as one’s horizon. 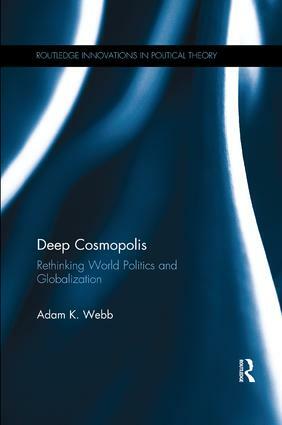 Digging into some fascinating currents of thought and practice in the ancient world, the Middle Ages, and the early modern period, across all major civilizations, Webb is able to reveal patterns of "deep cosmopolitanism", with its logic quite unlike that of liberal globalization today. In their more cosmopolitan moments, everyone from clerics to pilgrims to empire-builders was inclined to look for deep ethical parallels—points of contact—among civilizations and traditions. Once modernity swept aside the old civilizations, however, that promise was largely forgotten. We now have an impoverished view of what it means to embrace a tradition and even what kinds of conversations across traditions are possible. In part two, Webb draws out the lessons of deep cosmopolitanism for our own time. If revived, it has something to say about everything from the rise of new non-Western powers like China and India and what they offer the world, to religious tolerance, to global civil society, to cross-border migration. Deep Cosmopolis traces an alternative strand of cosmopolitan thinking that cuts across centuries and civilizations. It advances a new perspective on world history, and a distinctive vision of globalization for this century which has the real potential to resonate with us all. 1. Circuits of the Sacred 2. Civilisation with a Capital C 3. Beyond the Frontiers 4. The World Religions 5. Mediæval Mirrors and the Virtuous Outsider 6. Strutting on the Stage of Empires 7. Missionaries, Mystics, and the Melding of Faiths 8. Modernity’s Derailments 9. Globalisation and New Landscapes of Power 10. Relearning How to Talk Across Traditions 11. Interreligious Dialogue and Its Limits 12. Homelands and Hospitality 13. World Citizens in the Making 14. Void or Cosmos? Adam K. Webb is Resident Professor of Political Science at the Hopkins-Nanjing Centre, which is one of the two overseas branches of the Johns Hopkins University School of Advanced International Studies (SAIS).